Machinery Exhaust - Bortner Bros., Inc.
At Bortner Bros., Inc., we work closely with our customers to fulfill project requests while maintaining fast-paced quality work. We were recently contracted to fabricate and install a machinery exhaust system for a local manufacturer that could not afford to stop production for a lengthy duration of time. We worked together to create a schedule that would suit both of our needs to get the job done efficiently. 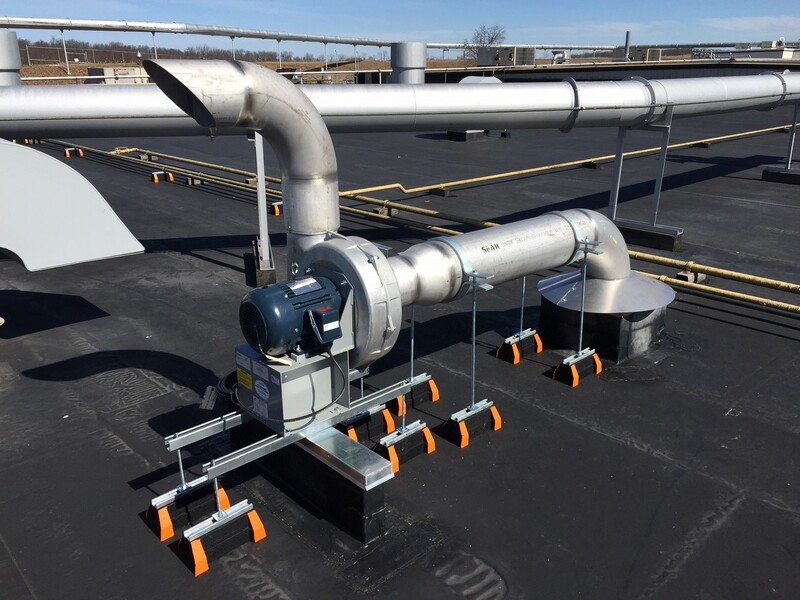 During this project, we were required to install Schedule 40 PVC interior piping with a transition to Schedule 10 welded stainless steel exterior piping for weather resistance and strength. We prefabricated the piping to further minimize the down time for the customer and created a strict schedule with insulation, roofing, and rigging subcontractors. By being prepared prior to onsite work, this particular machine was out of production for only three days reducing the cost lost to the manufacturer.